“The times they are a changing”; so goes the words of the Bob Dylan song, words which are certainly true for Beeston. As I write this, one of the biggest changes in the town’s history is taking place. Beeston is awaiting the arrival of the extension to the Nottingham Tram system. Changes, to the places where people live are inevitable. Sometimes change is a slow evolution and is hardly noticed. At other time, as with the Trams, the change is sudden and dramatic and has a huge impact. There are those who will remember the building of the shops of the Square in the 1960’s, the Bus Station and Multi-storey Car Park. This development took away the ancient centre of the old village, which was once around the crossroads of Middle Street, Dovecote Lane and Church Street, close to the Manor House. It was here that the medieval cross once stood, probably where the War Memorial now stands. Although there are no written records, it is likely that the cross was the focus for a busy and thriving market. The cross was taken down in 1860 and its stones used in a nearby wall. Here it remained until 1926 and its chance discovery by local historian and headmaster, Arthur Cossons. 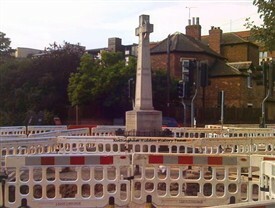 Cossons had the fractured stump of the 14th century cross shaft re-erected close to his beloved school on Church Street, where it still stands, now marked with a Blue Plaque. 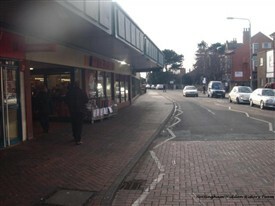 Beeston as we know it largely owes its existence to the development of a Saxon village close to the Trent and Derby Road. This village was surrounded by pasture and grazing land from which it takes its name – Bes – rye grass and tun – settlement or farmstead. The origin of this ancient name is still preserved in the name Beeston Ryelands, to the south of the town. At the time of the Norman Conquest of 1066, the then village had three Saxon Manors belonging to Alfag, Alwine and Ulchel. By 1086 these had passed to the Lordship of William Peverel. Although there is no mention of a church in Beeston at the time of the Domesday Survey (1086), it is likely that one existed. 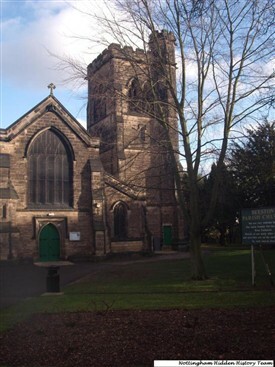 When Peverel endowed his Priory at Lenton he gave the ‘living of the church’ and the right to appoint a vicar to the monks. Probably under their influence, the simple wattle and daub structure evolved into a substantial stone building on the site of the present church. For the next 400 years not only the Church but the whole of Beeston and its villagers came under the control of the powerful Lenton Priory. By the year 1538, the year of the Priory’s Dissolution under Henry VIII, the medieval building had reached its height. It was in this year that the plague carried away a third of Beeston’s population of between 300 and 350 souls. Their bodies were interred in a communal grave on the east side of the Churchyard, adjacent to where the 'Wilkos' store was. This was later to be known as ‘the plague hole’. Approximately where the Wilkinsons store was, were cottages known as ‘The Poor Row’. These simply built homes were given to the poor of the parish where they could live rent free. The cottages were demolished in 1844/45. What became of the poor unfortunates whose homes they were is not recorded. Briefly interrupting the story of the area of Beeston directly affected by the Tram extension; Beeston saw one of its greatest changes in the early 19th century. It was at this time, with the growth of the weaving industry, that Beeston’s status changed from village to town. The first silk mill was built in the ‘new town’ in 1826. In 1831, after suffering various fortunes and a number of owners, the mill had passed into the hands of William Lowe. It was in this year that the town entered on to the stage of not just local history, but national history. The early 1830’s were troubled times for England. A new Bill had been put before Parliament, the Reform Bill, to change the voting rights of the common man. On Sunday 9th October 1831, crowds of supporters of the Bill had gathered in the Market Square Nottingham awaiting the Mail Coach with news from London. They knew that their local M.P. the Duke of Newcastle, who also owned most of the city, opposed the Bill. When the coach finally arrived the news was that Parliament had rejected the Bill. The crowd erupted into riot. Three days of violence followed, in which Nottingham Castle, the home of the Duke, was burnt down along with Colwick Hall. Certainly Beeston men were involved in the rioting. On the 11th October the rioters turned their attention to Lowe’s Mill and it suffered the fate of the Castle. In Victorian Beeston, the cycle of demolition and rebuilding continued. In 1842 the medieval church was surveyed and, with the exception of the chancel, found to be unsafe. Demolition of the old church was completed by 1843 and re-building around the medieval chancel completed by 1844. This new church was built in the Perpendicular style adapted to conform to the medieval architecture of the chancel. It would seem that the authorities had good reason for the clearance of the cottages of Poor Row. Tumbled down buildings would have spoiled the vista of their new edifice. Despite the increase industrialisation of the town, the illustration of the church at this time shows an idyllic scene, with sheep grazing in the surrounding pasture, something hard to imagine today. Not only do individual fields and closes survive, but their names survive on existing maps betraying a history which stretches back beyond the town’s Saxon roots. One such plot to the east of the church, where the Argos store now stands, was known as Roundhill. Across the Square, around the area now covered by Lloyds/TSB Banks, was Roundhill Gardens. The Round Hill to which the names refer was an ancient Bronze Age Tumulus which occupied the site of the Wollaton Road Methodist Church. It was upon the summit of this grassy knoll that the village stocks were fixed. Stocks were introduced to every village during the reign of Edward III, in 1376 and continued to be used until 1840. They were used for the detention of minor criminals, drunkards and the like, who could be detained for a few hours at the pleasure of the local authority. A little way to the west of the Round Hill, on the site of the old Town Hall, was another village institution, the Pinfold. This was a walled or fenced enclosure which projected a little way into the road. It was used to confine cattle and sheep which had strayed from their fields. The duty of ‘rounding-up’ these strays fell to an official called the pinder, who was elected annually at Easter. When in the near future, you are riding the Tram through Beeston, consider it as your personal time-machine and think of the history contained within this short journey. This page was added by Joseph Earp on 07/01/2014.